On Not Rushing Things, and a Kids’ Passover Cookbook Giveaway! This morning I thought I locked myself out of the house. I wanted to warm up the car before the kids got in it, but I had to use the set of car keys that doesn’t have a house key on it, because I needed the set with the house key to, you know, lock up the house when we left. As usual, it was a little bit of a balagan, and by the time I herded my little ones out the door, I was focused entirely on just getting them in the car and buckled. Plus, I was trying to maintain as positive of an atmosphere as possible considering my oldest was maintaining a strong not-wanting-to-go-to-school front. When this happens (which it typically does after a holiday, snow day, or other change in routine), I rack my brains to try to get him psyched to go to school. So this morning I let both of my boys pick any snack they wanted from the Purim loot, in an attempt to cajole my oldest into cooperating. They picked some grape juice (in the cute 6.3 oz size) and some wafers. I was very happy with those selections, and optimistic about going off to school with everyone in a good mood. But it was not meant to be. More than halfway to school, I hit a bump and my oldest’s grape juice flew out of his little hands and spilled all over the car floor. Miraculously, it did not spill all over him. Not surprisingly, he didn’t seem to appreciate that particular silver lining. Poor thing, he was traumatized, and screaming with all his might about his loss. I pulled into the nearest parking lot to try some damage control. My sweet second-born agreed to give some of his grape juice to his brother (that child is just good at giving, I don’t think it’s any parenting skills I can take credit for), but my oldest was inconsolable. Unless I could go back in time and reverse the spillage, he was not going to be happy. Fine. He still had to go to school, so while I drove there I davened for him to become calmer, and I took the time to walk him in myself (as opposed to letting him off in the carpool lane), and he was, more or less, okay. Thank G-d. Emotionally sapped, I dropped off my second son at his school and drove home. That’s when I discovered that I couldn’t find my house keys. I dumped out my purse, looked under my seat. Nothing. Desperate, I drove to the parking lot where we had stopped, thinking that maybe I had left my keys on my lap and they had fallen out when I had leapt out of the car during the Grape Juice Crisis. Passers-by may have been amused or confused at the sight of me, crouching on the cement, peering under the parked cars for my keys. But they were not there. I called one neighbor, but she didn’t have a spare key. I resignedly drove home, thinking I would knock on the other neighbor’s door, that maybe they had a spare (mental note: make sure neighbors have spare keys). Close to home, at a red light, I glanced over between the passenger’s seat and the console. And what do you think I saw? Yes. My keys. My beautiful, beautiful keys. That the keys were in my car the whole time reminded me that when I’m frazzled, rattled, or rushed, I rarely make level-headed decisions. I go straight to action-mode, which can be good sometimes, but not when I’m distracted or unbalanced. In those times, I rush through things, absent-mindedly or half-heartedly, and make silly and sometimes time-consuming mistakes. I’m so, so glad that my keys were not actually lost, and that I was able to get into my house, and that it was a gentle reminder that when panic starts to rise, I should take a few deeps breaths before jumping into action mode. Back was I was engaged, one of the wedding presents I received was a copy of Tamar Ansh’s book A Taste of Challah. The book is beautiful, full of delicious recipes, inspiring stories and helpful halachos. When I had the privilege to meet Tamar at her apartment in Jerusalem, to tell her the story of my shidduch, I was beyond thrilled. Not only was she a pleasure to shmooze with, she included our story in her book Riding the Waves, *and* she gave me a copy of another of her excellent books, Let’s Say Amen, which teaches kids the importance of answering “amen” to brachos. 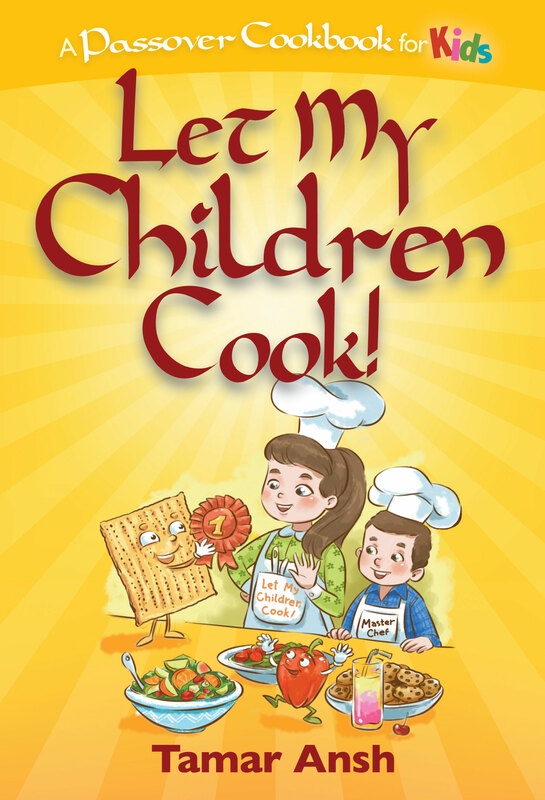 When I found out she has a new children’s Passover cookbook out, called Let My Children Cook!, I immediately asked her if I could do a giveaway, since I was sure it was going to be a great book. And she didn’t disappoint. Filled with kid-friendly recipes like Crunchy Chicken Crisps, Scribbled Eggs, Instant Tasty Salmon Steaks, Baby Carrot Tzimmes, and Fro-Yo Ice Pops, there are over 80 scrumptious dishes to pick from. The book is geared for kids ages 8-10, but there are some recipes in here that I think even my kids (5 and under) could try, with supervision, of course. We do love spending time in the kitchen. The book is a pleasure to look at, with humorous and attractive illustrations, directions that are well-thought out and easy to understand, and a lot of loving attention to detail. There is a helpful list in the beginning of the cookbook with smart cooking and safety tips that even adults could learn from (like reading a recipe straight through before starting – I still need reminders on that one from time to time!). I love how she includes little tidbits, like noting if a recipe freezes well, or suggesting a specific serving container. There are also some craft ideas in the back of the book, like making a Pesach apron, or a pillow for the seder, or placemats. So basically, if you have kids in this general age range, you want this book. I’m excited about it, and I’m excited to send it to one of you. To enter the giveaway, just leave a comment below with your favorite Passover dish. If you want an extra entry, share this giveaway on Facebook and leave another (separate) comment that you did so. If you want even another entry, tweet this giveaway and leave a separate comment that you did. Be sure to leave a good email address so I can contact you if you win. The giveaway will close at 11:59pm on Tuesday, March 25th. One of our family favorites is schnitzel coated in almond crumbs – prepared as if they were bread crumbs. shlishkes – we only make them once a year on Pesach! kugal! and shared on facebook. amazing sponge cake with hints of lemon…. Turkey soup for the sederim! My favorite pesach dish…hmmmm…probably my mother-in-law’s potato knishes. We always serve them erev pesach since there’s no matza meal in them. They’re great alongside a bowl of sweet and sour cabbage soup. My favorite Pesach recipe is the potato starch “matzah” balls in the chicken soup. Yum yum yum! My favourite is ‘French’ Matza – like French bread (the kind you dunk in watery milk and then fry up in a buttery pan)….you can have them savoury (salt) or sweet (honey, jam, etc). As for reading the recipe all the way through – just the other day I made a cholent and riiiight at the veeeeery end of the recipe it says add water to cover. It was a particularly hectic pre-Shabbat afternoon. Talk about a double ‘duh’ moment! My fave thing about Pesach is matzo and cream cheese. I know you can eat it all year, but I don’t and in my mind, it just means Pesach is here. We love lava cake and last year I made pesachdik “corn” dogs that all the meat eaters loved! Matza brei, the way my mother used to make it. Your poor kiddo! Going to school is hard enough, it must be so frustrating for you also when you hit a (literal!) bump in the road. He seems to have a similar temperament as my oldest, intense and very focused. Funny, my second is also really good about sharing. Maybe they learn that BECAUSE of their older sibling’s intensity? We had a cereal mishap in the car this morning, and I can totally relate. Luckily, we hadn’t left yet and my husband (who is usually at shul but today davened early) happened to be helping get the kids in the car and he was able to pick up a new bag of cereal. Disaster averted, phew! It’s so neat that you got close with Tamar Ansh! I think she has some Cleveland connection, but I used to watch her challah video and learned how to make different shaped challos from her. My mother-in-law has her challah cookbook, and I’ve been saving her all-too-infrequent guest recipe column from Hamodia for the last few years. My favourite Pesach “dish” is chocolate matza tort. It’s an amazing homemade chocolate sauce (cooked looooooong and slow in a double boiler) that’s poured under and over layers of machine matza. Then comes the sitting in the fridge – it’s always better at least 24 hours later. Not to mention the extra chocolate sauce, which is amazing for dipping fruit! Chopped avacado, mango, red onion, jalapeno, red bell pepper, with a little lemon juice. Great as a dip or as a relish over fish! chocolate-caramel covered matza bark – the best pre-afikoman dessert ever! I have a great recipe for toffee bars my friend’s mom handed down to me! Matza pralines and Matza granola. Matza grilled cheese and matza pizza are pretty good too. B”H my husband agreed to eat gebrokts after we got married!! My favorite is a classic – matzah brie!